When channeling energy within life force for spiritual enlightenment or for healing, Reiki is a popular choice. Reiki connects the body with the mind and treats it as such, one thing. In order to work with Reiki you must be in a relaxed, clear state of mind. Accompanying your energy healing with ambient music can certainly help to create that calm state. 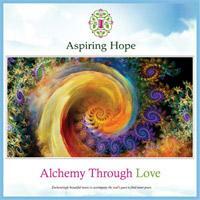 This featured album ‘Alchemy Through Love’ is an audio only CD, with music composed for the purpose of Reiki healing. The audio on this album is also often used for thought processing and relaxation.